Their names are Rocky and Miki and they're the size of your average housecat. From noon until 2 p.m., they'll be selling souvenir programs at Texas Motor Speedway. Suffice it to say, if you happen to be at the Gate Four concourse at Texas Motor Speedway, send video. 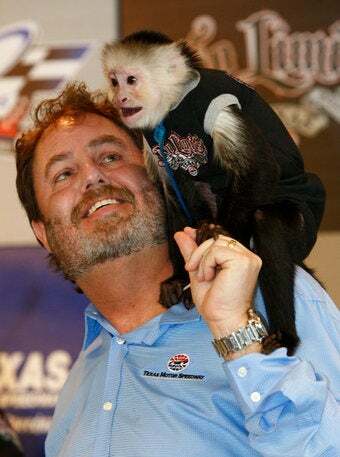 Even Rusty Wallace, broadcast analyst for the weekend's races and a former champion driver, couldn't resist coming over from pit row to cuddle one capuchin. "He's a cute little sucker, isn't he?" Wallace said with a smile as Rocky climbed across his shoulders. Wallace talked a TMS worker into snapping a picture, then bought two programs, one from each monkey.